World-renowned author Patrick McGrath will be paying us a visit next week, and we must share with you our enthusiasm for such a charming man and a marvelous writer. A London native, McGrath's haunting novels are in the Gothic tradition, and he's been described as "a worthy descendant of Poe." Several of his novels have been made into films, most notably David Cronenberg's Spider. 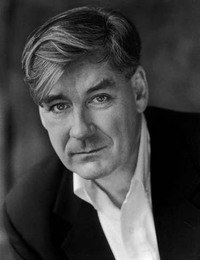 We've been fans of Patrick McGrath for years, ever since his best-selling 1997 novel Asylum, which brought his unique pairing of gothic sensibilities and psychological intrigue to a wider U.S. audience. Set in the bleak English countryside, in a hospital for the criminally insane, Asylum relates an unlikely love triangle involving a resident psychiatrist, his beautiful wife, and the patient with whom she falls in love and begins a torrid affair. The novel's creepy atmosphere and the characters' slow descent into madness, all aided by McGrath's swift and lucid writing, is what makes this one of our most frequently recommended novels. McGrath's themes of madness and obsession recur in new and sophisticated ways, as in his new novel, Trauma, narrated by Charlie Weir, a New York psychiatrist in the 1970s who counsels soldiers returning from Vietnam. He marries the sister of one of his patients, a troubled vet who later commits suicide, which in turns causes his marriage to unravel. It's only years later, after the death of his mother, that Charlie's wife returns to console him, and we begin to see how years of dysfunctional relationships, both family and romantic, have worked their own slow traumatic stress on a man descending into madness himself. Recently we asked the author a few questions about his work and the new novel. Read his answers below, and if you're nearby, come and hear McGrath (a terrific reader as well) next Tuesday at noon in the Alluvian Hotel's fourth-floor Terrace Room. Turnrow Book Co.: While reading TRAUMA, we were also caught up in the new HBO series IN TREATMENT, and so it was interesting to consider therapy as a useful storytelling device to get into the drama of characters' lives. You've used psychiatry and psychiatric disorders to great effect in you work. What are your inspirations in using therapy in your fiction? McGrath: I use psychotherapy in my fiction as a way to reveal and explore my characters' emotional predicaments, from which stories will always emerge. There is also a story to be told about the relationship of the therapist and the client, which is rarely straightforward. So in other words this is very rich, dense, human territory for a novelist. I should also say I'm a big fan of IN TREATMENT. Gabriel Byrne in fact played the father in David Cronenberg's film of my novel SPIDER. TBC: You create superb tension in your novels, but these are not necessarily your typical, plot-driven thrillers. Can you describe the process of creating a book like TRAUMA. What ideas/issues come first, and how did it all unravel on the page? McGrath: Difficult question, how the story develops in a book like TRAUMA. The character came first, Charlie Weir, the narrator. He evolved into a man with deep personal problems as I began to invent the first major conflict in the book, his marrying the sister of one of his patients and the subsequent clouding of his professional judgment, with catastrophic results. This is what usually gets a story rolling — conflict which grows organically out of a character's life and work and personality. TBC: The idea of trauma therapy is especially interesting now that we're seeing a lot of soldiers coming home from war missing limbs and suffering emotional turmoil. Did this influence your decisions about your main character's professional discipline? Do you think therapy can truly help people with severe post-traumatic stress disorder? McGrath: Yes, I do think therapy can help people with severe PTSD. My research while writing the book convinced me of this. As for traumatized Iraqi vets influencing my decision to make Charlie a trauma doctor, it was rather that I wanted Charlie to be a young man recently qualified in psychiatry in the early 1970s, which then led to him working with Vietnam vets, which in turn suggested parallels with what's happening today as another generation of young Americans comes home physically and emotionally damaged from an unnecessary and immoral war. TBC: We're used to the gothic settings and dark British mystery of your earlier work, and yet TRAUMA may be your most cosmopolitan novel yet. I guess you are a permanent fixture in New York City now, so has the city carved out new territory in your creative imagination? McGrath: Yes, I've been living in New York for almost 30 years now and am an American citizen. But it's taken me a while to move my work into my adopted country and city. The process began with my one historical novel, MARTHA PEAKE, which is about the American Revolution. TRAUMA is the first novel I've written with no British characters at all, though I recently published a book of three novellas all set in New York at different historical periods, called GHOST TOWN. It was a bit daunting, dispensing with mad Brits, but not insurmountable, and I plan to do it again in the next book. TBC: Can you recommend some good books you've read recently? McGrath: Recently I've read Philip Roth's EXIT GHOST, Denis Johnson's TREE OF SMOKE, Anne Enright's THE GATHERING, Peter Carey's HIS ILLEGAL SELF, Patrick White's A FRINGE OF LEAVES and the stories of Katherine Mansfield. I recommend them all, particularly the Patrick White. He was Australia's greatest writer, won the Nobel Prize, but many of his books are sadly out of print today. TBC: You've been to Mississippi several times, though never to the wild, swampy Delta, which may hold some similarities to the dark and sinister moors you've written about. McGrath: I've loved what I've seen of Mississippi, which is largely confined to Oxford and environs. I've known warmer hospitality in Oxford than anywhere I've ever been on book tour, and that's all down to the folks at Square Books. I'm looking forward very much to seeing the wild and swampy Delta and expect it to be as sinister as you claim.